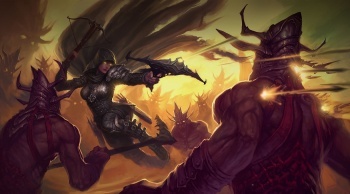 If you want to survive in Diablo 3, you're going to need to know your hand axes from your halberds. Luckily, Blizzard has you covered. Blizzard opened the lid of a veritable treasure trove of Diablo 3 loot, updating the Diablo 3 community site with hundreds of different items that will available to find, make and kill with in the game. Everything from the simplest helm to the most powerful magical wand is there to be perused, inspected, and - naturally - coveted. There's a caveat though: All of the items, from the simple helms to the mighty wands are using temporary art and data, meaning they're subject to change. Not really big changes like "The Sultan of Blinding Sand" - a legendary two-handed sword - becoming a common drop, but small changes like a point or two of damage either being added or subtracted, or a level requirement going up by one. There's also the fact that you're spoiling at least a little bit of the experience for yourself, kind of like opening your Christmas presents early. If you're curious about the arms, armor, and equipment you could be taking into the field with you in Diablo 3, you can start looking here. If you're not curious, then, well, do nothing, and we'll pretend this never happened.